presence of the Father and the Holy Spirit. Purchase 3 or more prints at half price! The overall matted size is 16" x 20". Framed Size 11" x 14"
Add $11 for shipping & handling. This print comes in a dark cherry finish frame with beaded edge. Print includes matting and glass. This print comes in a classic gold frame with daisy patina and gold metal embellishment. Print includes matting and glass. When home at last I go." Welcome Home copyright© 1984 by Danny Hahlbohm is prohibited from being copied. All applicable copyright© laws apply and are reserved by Danny Hahlbohm. Danny Hahlbohm art prints paintings pictures images and artwork of Welcome Home can be purchased at discount prices at Christ-Centered Art. 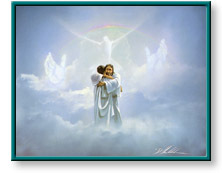 Welcome Home - Reunion painting by artist Danny Hahlbohm can be purchased in art print or canvas form at special sale prices at Christ-Centered Art.